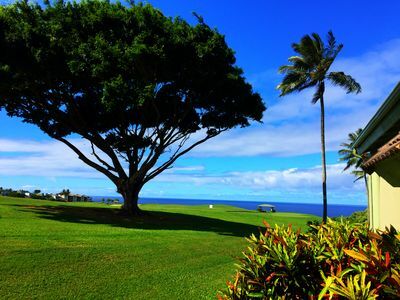 E komo mai ~ (Welcome) to paradise! 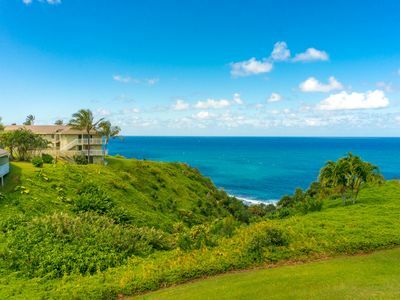 Spectacular ocean views, dazzling sunsets, privacy and relaxation await you at Pu’u Poa condo #208 located on the verdant north shore of Kauai. 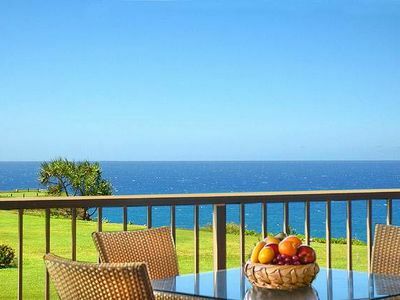 Indulge yourself in a private, luminous oceanfront getaway at Pu’u Poa 208. 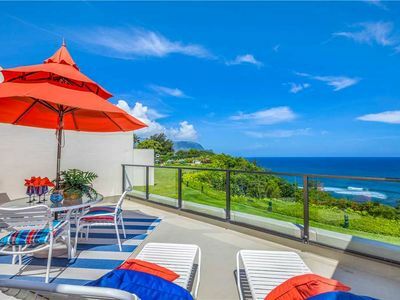 Spacious indoor living and outdoor lanais (patios) spill out over the pali (cliffs) of the exclusive Princeville resort community. 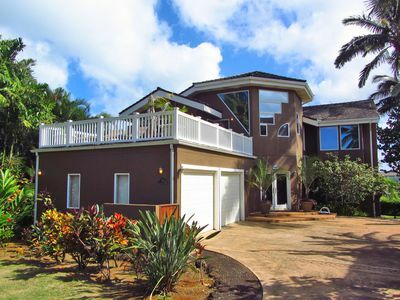 Enter your own private paradise at this gorgeous oceanfront Kauai vacation rental. 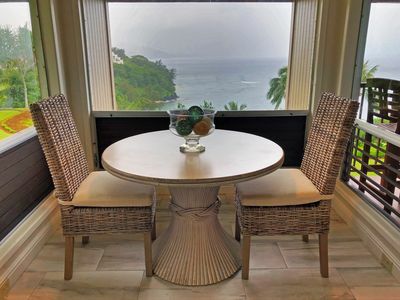 The spacious, contemporary and elegantly decorated, Pu'u Poa 208 is designed with all of your vacation needs in mind. 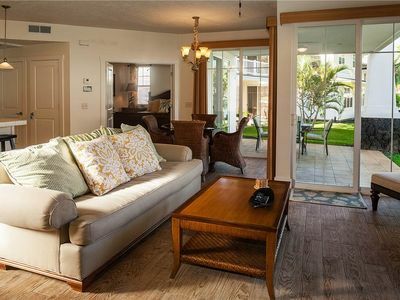 From the generously sized lanais (patios) as well as the spacious indoor living areas, you are called to relax and enjoy. 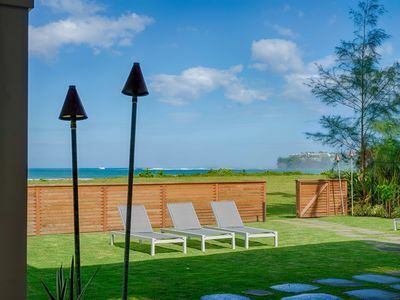 Let the gentle tradewinds caress your sun-kissed skin, and the luxurious ocean views sooth you. 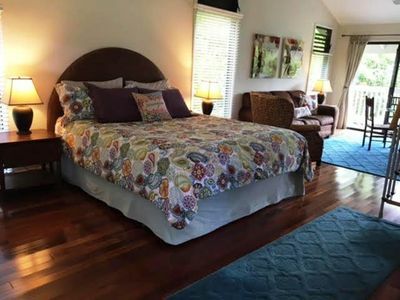 The Master suite has exquisite ocean views, a King size bed, private lanai with a table, chairs and lounges, and a deluxe, private bathroom including an open shower. The second bedroom has a lovely Queen size bed. A second full bathroom is located in the hall. . 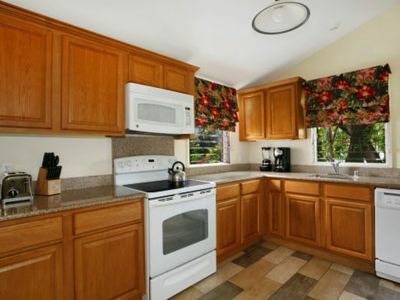 The recently upgraded kitchen includes state-of-the-art stainless steel appliances. 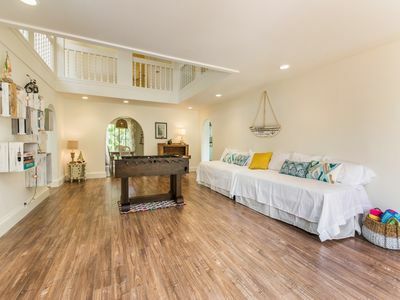 The gorgeous dining area is perfect for entertaining. Please enjoy the DSL high speed internet, TV/DVD in living room, beach gear and toys, our fully equipped kitchen, our private oceanfront lanais (patios), a secluded pathway down to Hideaways (Pu’u Poa) beach, swimming Pool, tennis courts, the 5-star St. Regis Princeville Resort next door, and the walking path to several dining, shopping and entertainment options. 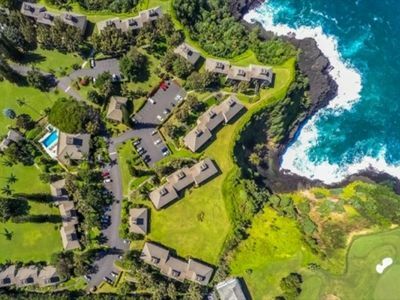 The world-class Prince and Makai golf courses are located minutes from Pu’u Poa condos. Just 5 minutes down the road is the Princeville Shopping center offering Foodland grocery market, Tiki Iniki Bar & Grill, Lappert’s ice cream shop, North Shore General Store/gas station, several boutiques, 2 banks and post office. 10 minutes down the road (heading north west) is world-famous Hanalei Bay where a long stretch of white sand beach awaits you. Enjoy big wave surfing in winter, and small, rolling waves in the summer time. Kayaking, swimming, snorkeling, shell picking are a few options. 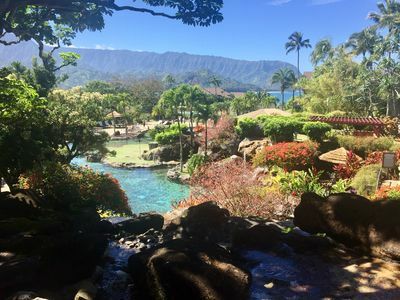 Hanalei town offers several restaurants including Bar Acuda , The Hanalei Dolphin, Bouchons, Postcards café, Kalypso, Hanalei Gourmet, Bubba Burgers, Tropical Taco, Tahiti Nui and Java Kai. 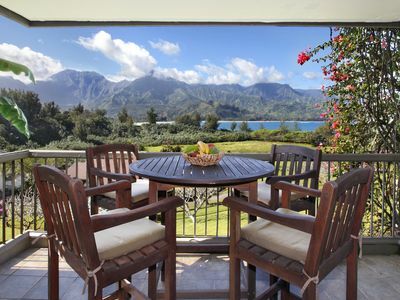 For live entertainment head on over to the Hanalei Gourmet, Kalypso, or Tahiti Nui. If you have any additional questions or needs, just let us know. We are happy to accommodate you! 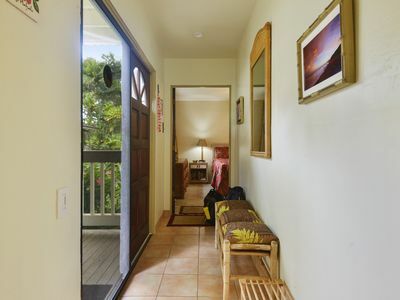 Featured in COASTAL LIVING Magazine's article "12 Best Rentals in Hawaii"
Hanalei Bay Resort #4204/05/06: Great Hanalei Bay Views with Air Conditioning! 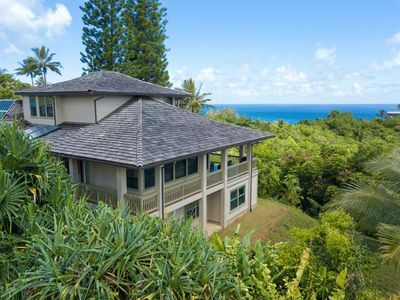 Beachfront on Hanalei Bay, New Construction, A/C, Modern! Come Visit This Tropical Island Getaway! Make Lifelong Memories at Bali Hai! Take a Relaxing Trip to Bali Hai! 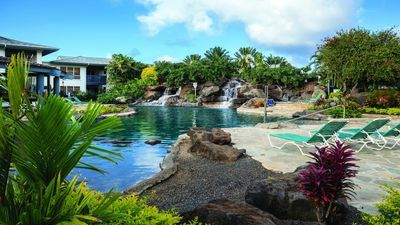 Bali Hai Villas: Your Hawaiian Vacation Destination!